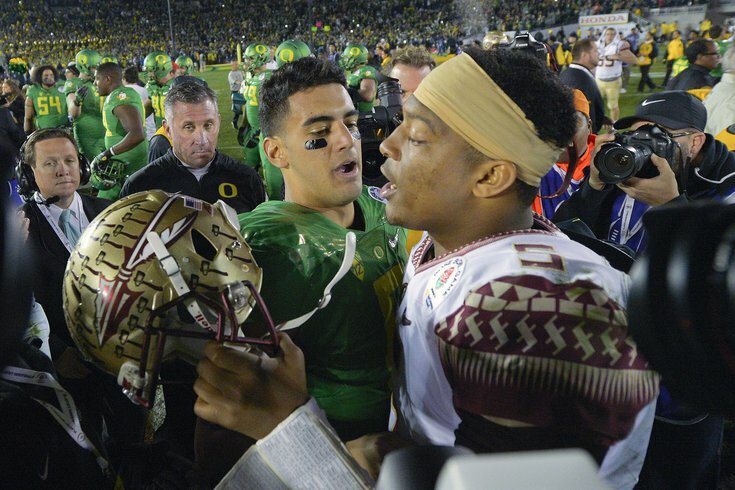 Oregon quarterback Marcus Mariota, center left, greets Florida State quarterback Jameis Winston after Oregon's win in the Rose Bowl on Jan. 1. INDIANAPOLIS -- The Buccaneers own the first overall pick in the NFL Draft, and they know who their favorite quarterback is, although obviously, they didn't volunteer which one. Buccaneers general manager Jason Licht called it "an insult" to say they didn't prefer one over the other. Obviously, if the Eagles were to have an interest in either Mariota or Winston, it would be Mariota because of his familiarity with Chip Kelly's offense. However, Oregon's non-traditional offense could have a negative affect on his appeal to other teams, as noted by Bucs head coach Lovie Smith. “There’s a transition for any college player coming to the NFL," said Smith. "And in Marcus’s case, they run an offense that most teams in the league don’t run. But I’ve seen him scrambling around, making decisions and for the most part making the throws that we’re making in the league. “It probably helps a little bit if you’ve been doing more of the same thing you’ll be doing in an NFL game." Smith also noted that Winston only lost one game in his college career. “From what I know, and that’s watching game highlights and watching TV and of course, watching a lot of video right now, they’re two talented players that have different styles who have won a lot of football games. And what do you judge quarterbacks on? Accuracy, decision making, leadership. And both of these players, the two win football games. Jameis and Marcus, they’ve won a lot of games. Jameis didn’t lose a game until the last one he played. That says a lot about him. “We need a quarterback that can throw the ball and make a variety of throws, we need a leader, a guy who makes great decisions. We’d like to have a guy who is mobile in the pocket." Interesting what Smith said the Bucs "need" and what they'd "like."